MovieMaker Magazine on Wednesday confirmed what staff and fans of Telluride Mountainfilm have known for decades — that it’s one of the coolest festivals on the planet. 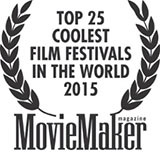 Mountainfilm was included on the magazine’s 2015 list of the 25 Coolest Film Festivals in the World. The list, which was compiled by a panel of festival experts, also features such acclaimed film festivals as the Berlin International Film Festival in Germany, Edinburgh Film Festival in Scotland, True/False Film Festival in Missouri and Hot Docs in Canada. MovieMaker’s annual list seeks to identify the great festivals that allow cinema to transcend form to become more than itself, according to the magazine. “These celebrations from around the planet, picked from nominations by our 2015 Panel of Cool, have the purity of vision to guarantee experiences that you’ll think and talk about for years to come — ones that just might change your life,” the magazine wrote. The panel of judges included film industry experts, such as Aaron Katz of Oscilloscope Laboratories, director Daniel Barber, film critic Philip Cheah and sibling filmmakers Ravi and Geeta Patel. MovieMaker is a California-based publication that specializes in the art and business of filmmaking. The magazine had a readership of more than 160,000, and is the world’s most widely read independent film magazine, according to its website.